Fieldays 2018 was on Rob’s agenda this year, and well worth a stop in. It was awesome to see so many of our photographs printed as large murals. We have a large selection of stock images that work well at massive sizes (shot on medium format digital and professionally stitched into massive files) which are suitable for quality exhibition backdrops, and branding displays. Rob does commissioned photographs too, and we did a couple of massive murals for Honda Power & Marine this year. Can you spot the celebrity in one of them? Nope, not Clark Gayford, although Rob let him know he wasn’t stalking him, he happened to be in shot of one of the professionally stitched panorama’s we did for Honda. Kate the Corgi made her debut appearance, a little know fact outside the breeding clubs, Corgi’s are a cattle herding dog breed. We had some great feedback from The Ministry for Primary Industries (MPI), who were very happy with the quality and feel of our images. It was great to work with Adam from Station Creative on the MPI stand this year, he’s very much into quality too, so a successful Fieldays for 2018 across the board. 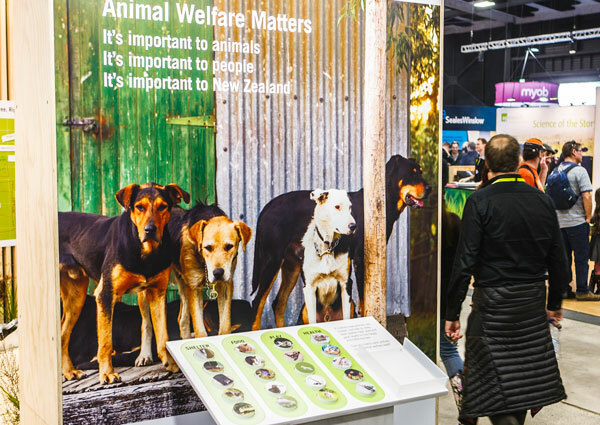 You're reading Fieldays 2018 murals at Nature’s Pic Images Blog.